The vehicle information above was correct at time of manufacture. Please speak to the dealership for full current specification. 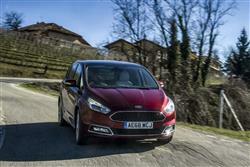 Ford's improved second generation S-MAX continues to demonstrate that larger MPVs don't have to be boring. Jonathan Crouch explains why. People-carrying MPVs do tend towards being a bit boring. They're ostensibly big boxes on wheels and notions of style or handling dynamics don't tend to come very far up the priority list for their manufacturers. Unless that manufacturer is Ford and that vehicle is an S-MAX. Ford's seven-seater offers impressive handling and some amazingly clever safety features, plus surprising efficiency from the now more frugal range of EcoBlue diesel engines. It doesn't look like being deposed from its position as our segment favourite anytime soon. When the old S-MAX arrived in dealers back in 2006, we wondered what the heck it was. Didn't Ford already sell us a seven-seater called a Galaxy? Yet here was something that rode on the Galaxy chassis but was a bit more Miss Brahms and a bit less Mrs Slocombe. It looked great and Ford had made a number of subtle tweaks under the skin so that it drove as sharply as it was styled. It was an instant hit. True, it wasn't the first seven-seater that was great to drive. Honda's dull-looking Stream VTEC was a hoot to steer, but keep that little tip under your hats, used buyers. Anyway, the S-MAX lasted more than eight years, which is an eternity in this market, so the second generation model had better be good. 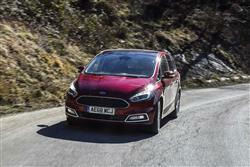 Ford introduced the car in the Summer of 2015 and now we've thoroughly tested it. On the road, this car is as good to drive as ever. The range now hinges around a much improved family of EcoBlue 2.0-litre turbodiesel engines, offered in 120, 150, 190 and bi-turbo 240PS outputs. Improved low-end torque is a particular characteristic of these latest-generation powerplants. The range also now benefits from a more refined, smoother-sifting 8-speed auto gearbox which alters its shift pattern to suit your driving style. It also enables the fitment of Adaptive Cruise Control and includes an engine Stop & Go system. The brand's intelligent all-wheel drive (I-AWD) set-up continues to be offered at the top of the range. The system continually measures how the car's wheels are gripping the road surface every 16 milliseconds; can adjust power delivery to individual wheels in 100 milliseconds; and can send 100 per cent of available engine torque to the rear wheels. 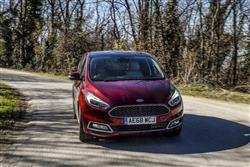 Petrol engine options include Ford's fuel-efficient 165PS 1.5-litre EcoBoost with manual transmission and the 240PS 2.0-litre EcoBoost with 6-speed automatic transmission. Ford's clever integral link rear suspension helps enhance the signature car-like, sporty driving dynamics with a configuration that features reduced-weight aluminium components. Additional sound-deadening materials and improved door seals contribute to a particularly quiet cabin. Ford talks at length of this second generation model's sleeker styling avoiding "visual noise" but some may feel that the looks of this MK2 S-MAX design have lost a little of the visual impact that marked out its predecessor. The front pillar is moved further back to create a longer, sculpted bonnet and a raised chrome trapezoidal grille and slim headlight design target a 'technical' and cutting-edge look. There'll be much less debate about the rear three-quarter styling, with a distinctive window-line complemented by LED tail lights that add visual width. They're connected by a signature satin chrome strip, while a rear diffuser separates the exhaust outlets. There are no complaints about the cabin, Ford having done a great job of bringing a more upmarket feel to the fascia, with better materials used throughout and a cleaner centre stack. The steering wheel's a bit busy as a result but you'll get the hang of it. The seats retain the usual 2-3-2 layout, this time with no fewer than 32 seating and load-space combinations, as well as Easy-Fold second and third row seats. The system enables each rear seat to be folded flat from a push-button control panel. The S-MAX now also features Easy-Entry second row seats that provide one touch access to third row seating with a new design that tips and slides the seat forward in one action. Storage also includes new covered stowage in the instrument panel top, a media storage area incorporated into the centre stack, and concealed under-floor stowage behind the third row. There's not a lot of luggage space, with the third row raised, but drop the rearmost seats and you have a really wide, conveniently-shaped 700-litre boot. 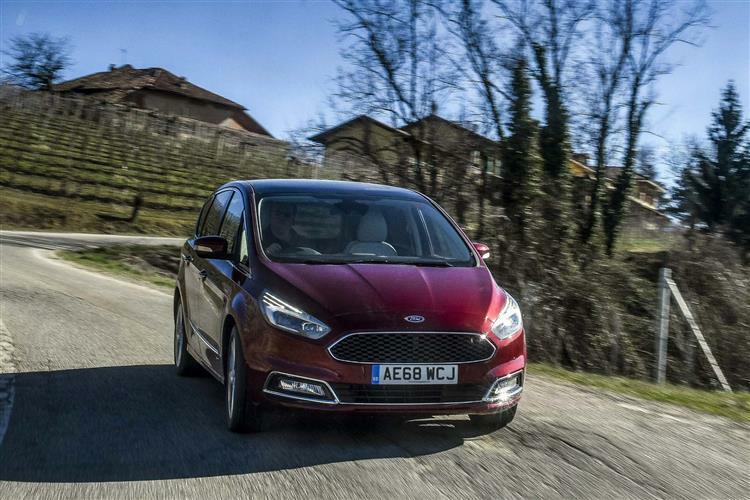 Prices start at around £27,500 for base 'Zetec' trim, but that only gets you a petrol model; the cheapest diesel requires a budget of just over £29,000. 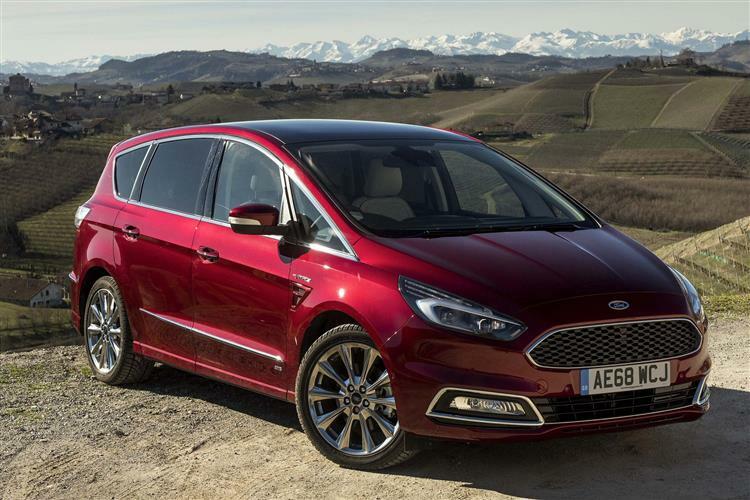 Above 'Zetec', there are three further trim levels; 'Titanium', 'ST-Line' and plush 'Vignale'. Even base 'Zetec'-spec gets you plenty of kit though, including 17-inch alloys, the SYNC3 infotainment system, parking sensors, keyless start, a DAB radio, sports seats, power fold mirrors, a tonneau cover, an electric handbrake and ISOFIX attachments for child seats in the second row. Go for 'Titanium' spec - as 70% of S MAX customers do - and you get sat nav, privacy glass, rain sensing wipers and automatic headlights, LED daytime running lights, a lane keeping aid, keyless entry, traffic sign recognition, body-coloured trim bits and cruise control with adjustable speed limiter. Near the top of the range, the 'ST-Line' variants come with a body kit, 18-inch alloys, a rear spoiler, sports suspension and heated front seats. Beyond that, you can choose the ultimate S-MAX, the 'Vignale' variant, with bespoke leather trim and a unique customer service package. Across the range, there are all sorts of extra-cost options, but perhaps the most intriguing is the Intelligent Speed Limiter, which reads speed limit signs and then prevents the vehicle exceeding the posted speed. Don't worry, you can switch it off if you like. Pre-Collision Assist with Pedestrian Detection also uses a camera-based system, this time to scan the road ahead, recognising the shapes of people and applying the brakes if the car thinks you're about to run over one. The diesel engines all return excellent economy. In the 2.0 TDCi 120PS variant with 17-inch wheels, you'll see 55.4mpg on the combined cycle and 134g/km of carbon dioxide (or 56.5mpg and 132g/km in a 150 or 190PS version). You'll hit those returns by nearly 10% if you opt for four wheel drive or the Powershift automatic gearbox. At the top of the range, the 210PS Bi-Turbo manages 47.1mpg with 156g/km emissions. The 1.5-litre petrol model posts a 43.5mpg figure, but we'd take that with a pinch of salt. A small petrol engine is going to struggle to move a seven-seater, especially if you're running laden quite a bit. The warranty is a 3 year/60,000 mile deal with Ford Assistance for 1 year, providing roadside assistance in the UK and throughout Europe. 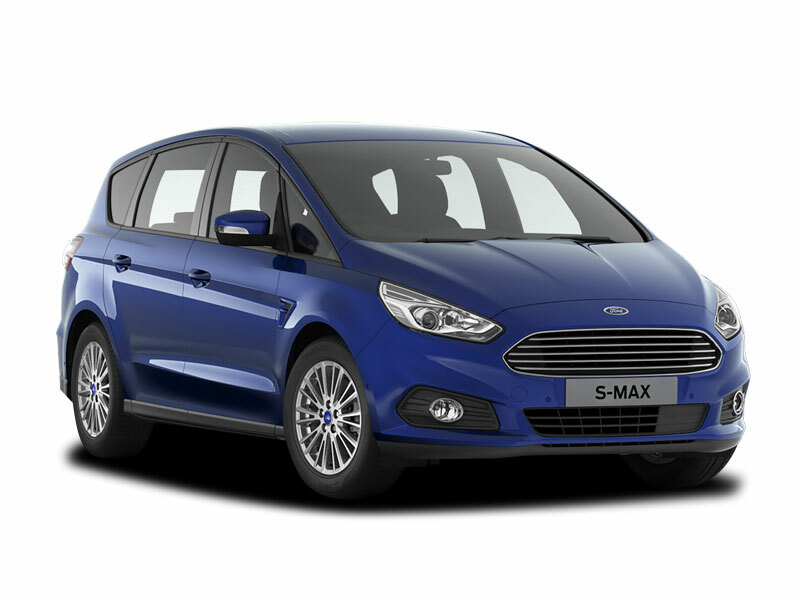 You'll have to make your own mind up on the aesthetics, but in every other regard, the latest S-MAX continues to be a compelling choice in the large MPV segment. Some may wonder whether this car really offers £4,000 of added utility over cheaper mid-sized 7-seat MPVs like Renault's Grand Scenic or Citroen's C4 Space Tourer. If you enjoy driving, you're going to want to convince yourself that it does. The engine choice seems to offer something for everyone, the technology is now bang up to date and safety standards are very class-competitive. 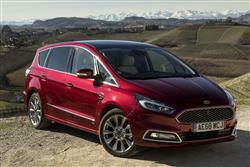 In short, we still think that the S-MAX deserves the big billing. Try one and you'll see why. ** MPG figures are obtained in laboratory testing and intended for comparisons between vehicles. Please be aware they're not intended to represent real world efficiency. OFFER SUBJECT TO STATUS, TERMS AND CONDITIONS. CLICK HERE FOR DETAILS INCLUDING OUR PANEL OF LENDERS. To find your nearest Ford branch, please enter your location. * Calls may be recorded for quality or training purposes.